Congratulation from the entire family of Saint Demetrios to Jon & Ashley who had their baby on Dec 16, 2017 Mathis Steven Xynidis. Here comes another future altar boy, dancer, and diver. May the Lord of the poor and the outcast bless your life through his birth, and may your love and help expressed through serving food to people who cannot afford to feed themselves shower your life with abundant mercies and blessings. received a delicious Thanksgiving meal. Philoptochos Christmas food drive has started. Philoptochos & Sunday school are partnering for the food drive. There are 2 marked decorated baskets in the narthex. Food will benefit local school children in need. Last day for donations is Dec.15th. Philoptochos has a Christmas “angel of hope” tree decorated by GOYANS. Philoptochos has partnered with the GOYANS. They came together last Friday to put up the tree, make angels & ornaments. All Gifts benefit local school children in need. It was an impressive, very well presented, informative tour. The staff at Halifax were very appreciative of the donation and touched that St. Demetrios kids fundraised and were giving to children in need. Executive Director Mr. Petrock invited GOYA back to tour Halifax Emergency room. Of course, we accepted his offer. Tentative date to be scheduled towards the end of January. I am waiting to hear when photo & article will be in the paper & will let you know. The year 2015 was one of the challenging years in the life of Saint Demetrios parish. Many beloved parishioners were called by the Lord Jesus Christ to the heavens within short period of time. The parishioners of Saint Demetrios were challenged as they were facing the absence of beloved parishioners before recovering from the loss of previous ones. On December 12th as in one of the cases; two parishioners departed to the heavens; Nancy Jennison, and Nikolaos Karamitos. If it were not for the grace of God and his divine grace healing and comfort would have been impossible to attain. The divine services, prayers, and memorial remembrance brought back the needed hope through the resurrection power of Jesus Christ to the wounded hearts and weary souls. As the militant church continues to live in this world and struggle for the sake of her children, we are reminded that through Jesus Christ we are not left alone, death and struggle cannot break us as they cannot break or overcome the Lord Jesus Christ who has defeated death once and for all. The departed faithful parishioners of Saint Demetrios are the ambassadors of the church community in the heavens. They continue to carry in their prayers the rest of the parishioners that are still struggling and fighting the good fight in the name of Jesus Christ for his sake and inspired by his love. They continue to be remembered and prayed for during pray- er services as they continue to be members of the universal church that enjoy the benefits of our prayers, and feel the love that is expressed through them. May this Christmas season, through the grace of Jesus Christ, bring comfort to the hearts of all that have departed beloved ones whom they dearly miss, and grace to comfort the souls of all the departed parishioners and relatives of Saint Demetrios parish. The celebrations of the Archangel Michael and Gabriel commemoration and all of the angelic bodiless powers of the heavens are also an occasion to celebrate the feast day of our Metropolis of Atlanta. Every year this event becomes an opportunity to honor an elected group of parishioners from each parish that had been chosen by their fellow parishioners to attend this honor banquet and to be recognized for demonstrating an exemplary dedicated service and ministry in the name of Jesus Christ within their parishes. Maria Augustine and Ted Nikolla had been chosen during the spring of 2017 through prayers by casting the lots as the 2017 honorees of Saint Demetrios parish of Daytona Beach to be by His Eminence Metropolitan Alexios of Atlanta this past week. Ted Nikolla was able with his wife Patti to attend the grand banquet but Maria Augustine was not able due to the Greek festival to travel to Atlanta in person and will be recognized at a later time at Saint Demetrios for her exemplary services. Congratulations to both of this year’s honorees; Maria and Ted, and may God bless and strengthen all of the quiet and hardworking parishioners who serve God Jesus Christ with love and dedication through Saint Demetrios parish the vineyard of our lover of mankind Savior in Daytona Beach, FL. Please enjoy reading the following thank you note in regard to the Greek Festival from this past week. I am confident that the volunteers during the four days of the Greek festival have received as I did numerous thankyous from our guests expressing their sentiments for a wonderful job and well run festival. The feedback I heard from the church tours’ group was very encouraging, and this particular thank you note was sent by a group of guests from an- other Christian church that was studying Church history and enjoyed at- tending the church tours presentation. Even though this specific note is addressing the area of the church tours but in reality it is a reflection of the positive impression of our guests about the entire festival, and the level of the dedication shown by all the volunteers to present a real nice family fun experience. Thus, please I kindly urge you to convey to your festival team or booth members a warm appreciation for their level of dedication within their specific area. Thank you to the entire church community for working together as one team, and for putting forth your best effort to offer the finest presentation within your area of service during the 2017 Greek festival. Each booth of the Greek festival complements the other parts, and all the parts together serve the goal of providing as one team a well-rounded and balanced event to our city and its surroundings. The reported numbers about the attendees of the church tours show that the spiritual nourishment of the guests is as important to our festival supporters as the Greek food, sweets, and the other venues that are made available during these four days to our guests. Thank you so very much for your time and hospitality as you gave us a tour of your beautiful church! As we looked at your church history that day, you reminded us that there is much more that unites us than divides us as Christians on this journey. Thank you for sharing your wisdom, your joy, and your faith with us—you have helped to shape us as we prepare to receive confirmation. As we journey closer to the sacrament, we ask for your prayers—you’ll be in ours! This is the time of the year where families participate in the Christmas Card Drive and submit their names. Thank you for your continued generosity, and support of this free will offering. Wednesday December 6, is cut off date. Saturday October 28, Team St. Demetrios GOYA joined 10,000 walkers as one in the Making Strides Against Breast Cancer walk. Like so many there touched by this disease, We walked for our Yia Yias, Mothers, Theas and friends #warriors We look forward to the walk next year. St. Demetrios GOYANS would like to thank everyone for supporting our bake sale where all proceeds go to children fighting cancer. Donations are still coming in! As in the past we have again designated parking for our volunteers for Festival. Each volunteer is to place their parking pass on their dashboard when entering the parking lot so the attendant can direct them to the designated area. Each parking pass will be imprinted with the Booth name, and a line to write your name on and cell phone number. In the event your car blocks someone, we are able to contact you to come move it. Only those volunteers with passes will be allowed to park in the designated area in the parking lot across from the church and in the few spaces available behind the church. The committee for the Annual Community Thanksgiving luncheon would like to thank all of the wonderful donors who contributed to the 24TH year of this event. We give thanks to our dynamic servers who served everyone with a joyous smile. We are thankful to our Sunday school for the very artfully decorated placemats. This event is a blessing for our church to serve our community in this manner. Let us join together this year in keeping the tradition of hospitality strong within St. Demetrios by supporting the thanksgiving dinner. Please contact Joyce Louizes, Stacy Augustine or Maria Augustine (386) 405-3025 to volunteer your time this day or to donate towards the cost of the dinner. The season of holidays is just around the corner. The Thanksgiving holiday is another opportunity to offer thanks to God. Among the several projects that are taking place during this season is the Drive of Love; the Philoptochos of Saint Barbara and the Sunday school of Saint Demetrios are working together on a wonderful project inspired by the spirit of thanksgiving and service to others. Within our own neighborhood, and only in one of the high schools that many children attend from Saint Demetrios parish there are twenty one families in need. Philoptochos of Saint Barbara and Saint Demetrios Sunday school through your support will participate in providing gifts of love to these children and their families in the name of Jesus Christ; the God of love for all humanity. Please bring to the church by TUESDAY the 14th of November your non-perishable food offerings to be blessed then the GOYA will deliver to the counsel at the school and forwarded to the beneficiary families. The food will start being given out on the 16th. The aim is to deliver the gifts to the families before the close of the school. The baskets will be set in a way where the twenty one families can have two meals a day during the holidays. Thanks for your help in assisting these families and for making it possible for the youth at Saint Demetrios to get hands-on experience serving people that are going through challenging times. Being thoughtful of others’ challenges and needs, and being sensitive to their pain and difficulties is a crucial message of the holiday season. Breakfast bars, cereal, oatmeal, juice boxes, nonperishable breakfast foods to sustain the children through Thanksgiving break as they rely on free school breakfast to be fed. Booth Chairman are to pick up their parking passes for their booths from Phyllis in the office. Each Chairperson needs to pick them up no later than Sunday, November 5th before Festival begins. Please encourage your friends to use our bus shuttle. Through the prayers and intercessions of Saint Demetrios the protector of our parish the month of October has been blessed with many joyful events. The peak was the celebrations of Saint Demetrios feast day. We have been blessed to have among us His Eminence Metropolitan Alexios of Atlanta to preside over the celebrations, and spend two full days among us. Many clergy from the surrounding areas have joined in the celebrations and enriched it with their presence and prayers. The parishioners of Saint Demetrios have worked tirelessly to organize the various events with all the needed attention to small but crucial details. The church hall and building were full of movements and parishioners especially the last few days leading to the vespers service. It was delightful to watch the spirit of service, harmony, and cooperation that permeated the entire church campus. The fruits of this harmonious cooperation and dedicated love to God and his church made a strong impact upon the celebrations in the days after. The evening reception that was hosted by Philoptochos after the vespers service was an enjoyable night. The luncheon to the honor of Saint Demetrios was a very happy time. The family night with His Eminence was a superb gathering of joy and happiness. The church services were graceful and uplifting. The church services felt and sounded like a heavenly realm through the prayerful singing of the visiting chanters along with our own choir. The family night was a very fine conclusion for the visit of our shepherd in Christ His Eminence Metropolitan Alexios. The children, sang, spoke, danced and filled the room with joy and happiness. These celebrations were an awesome opportunity for many God loving parishioners to sacrificially give themselves and of themselves a gift of love as a gratitude to God and out of thankfulness for his bounties. May God bless all of you and everyone that did not hesitate to sacrifice whatever was within their means to invoke blessings from God upon our Saint Demetrios parish. The grace and blessings that were poured richly from God were much needed to water and energize many weary souls, and to bring joy and gladness to many thirsty souls. Thank you to all the donors, volunteers, and silent helpers that made it possible for our parish to celebrate one more time gloriously the commemoration of the protecting saint of our church. Congratulations to Stavros and Penny Cruz on celebrating fifteen years of married life. They received a blessing and thanksgiving prayers last Sunday. Be- low is a brief write-up that Penny had written ex- pressing her sentiments that she shared with friends and family. Glory to God Jesus Christ who has blessed his creation and his vineyard of Saint Demetrios with abun- dant mercy and compassion. This year again we had another opportunity to be with one another and to celebrate the end of summer and start of fall activities. The annual dinner dance of Saint Demetrios community was a suitable opportunity to start warming up for the celebrations of Saint Demetrios feast day that is coming up on 25th – 26th of this month and will be enriched by the visit of His Eminence Metropolitan Alexios of Atlanta, to prepare for the big event of the Annual Greek Festival, and God-willing to enjoy awesome thanksgiv- ing and Christmas seasons and families reunions. The number of volunteers and people who worked in various areas to make this event a happy family event has increased in number as well as in the range of ages. Young and older have worked together and shared the commodity of friendship and brotherhood. Thank you for your donations, participation, energy, enthusiasm, and for being part of the memories and the family of Saint Demetrios. May God bless your work and reward you with his love and mercy. This has been a very busy summer for Saint Demetrios parish. There were extra events and luncheons that happened through the initiatives of several families and parishioners that made it hard to have an early start for the dinner dance as it has been in the past. The dinner dance is only less than a month away. Everything is ready to make it a wonderful reunion after the summer break for all of Saint Demetrios parish. Help is needed with the sale of the tickets. Your support is very much needed. Please make the dinner dance another successful year through obtaining tickets for you, your family and friends. Thank you for your continuous support and care that made all the previous events and functions of Saint Demetrios happy memories for all of Saint Demetrios families. See the attached information. Please email me back with your reservations. There will be no tickets sold on the day of the event. Saint Barbara’s Philoptochos would like to thank everyone who so generously donated toward Hurricane Harvey Fundraiser. Because of your donations, 2 local Houston churches affected by Hurricane Harvey, Saint Basil the Great Greek Orthodox Church and Annunciation Greek Orthodox Church, as well as IOCC received assistance. Without your continuous support, these donations would not have been possible. This August, Saint Barbara’s Philoptochos gave 101 blessed backpacks, full of school supplies to Volusia county school children in need. The first meeting is September 20, immediately aft the Paraklesis service. We will meet again October 18, then break until January 2018. Just kindly show up or for any questions please call Peggy Parker at 386-756-8473. September 21 PC meeting 6:00 p.m.
 September 28 Ministry Meeting with PC 6:00 p.m.
 Oct 7th Dinner Dance 6:00 p.m.
 Oct 25th St Demetrios feast day vespers service presided by His Eminence Metropolitan Alexios and followed by reception by Philoptochos 6:00 p.m.
 Oct 26 St. Demetrios Feast Day- Orthros 8:30 a.m. Divine Liturgy 9:30 a.m. Departed parishioners Memorial 11:00 a.m.
 Oct 27th Feast Day of St. Nestor Orthros and Divine Liturgy starting 8:30 a.m. The days leading to the previous Sunday were a major challenge to millions of people in this hemisphere, and to the people of the state of Florida. At Saint Demetrios church like many other countless number of people faced the challenge of Irma with prayers and supplications to God. God in his mercy heeded the prayers of his people and showed tremendous compassion, and reduced the destructive impact of the storm to a fraction of what originally had been predicted. Glory to God at all times and under all conditions, we thank God for saving Saint De- metrios church, its parishioners, and the people of our city and surroundings from major catastrophe and loss of life. The pier and Saint Demetrios front deck has been impacted through the winds to a significant degree. The same thing had happened after “Matthew” last year. Thanks be to God that this is about the most we have to deal with and to rebuild through the help and the grace of God. If there are families from Saint Demetrios that might need help to recover from the storm impact, please let me know privately,and I will check with the resources that are available. We will definitely try to do something if and when possible. Likewise, if you are in a position to provide help to others that are in need, please talk to me privately, and may God bless you for your thoughtfulness. Thanks for all that came to check on the church property after the passing of the hur- ricane, and to those that helped in any other way to provide support. This past Sunday on August 20th, Vasiliki Panos the wife of our chanter Mr. Nick Panos with the blessing of His Eminence Metropolitan of Atlanta Alexios was ton- sured a nun with the name “Sister Monica”. Reverend Father Polikarpos the Abbot of the holy monastery of Panagia Vlahernon in Ocala performed the service of the dedication of Vasiliki as a nun at home. The sisters from the women’s monastery of Annunciation in the Ocala area were present and took part in the service as they supervised and helped to dress Vasiliki with the clothes of the monastic habit. nun and wanted to join the monastic life. However, since she took care of their special needs daughter Irene for all these years, she could not fulfill her wish and continued to live a life style similar to the way of nuns and monks at home. Vasiliki as you know by now had been diagnosed with terminal illness. She was taken to a hospice facility for a short time and fell asleep peacefully late on Wednesday evening the last day of the feast of the Dormition of the Mother of God. Vasiliki “Sister Monica” had a thankful attitude when she was informed about her illness and the short time that was remaining for her upon the earth. Aware of her short remaining time, she began to prepare for her heavenly journey, and despite her pain and discomfort she continued to attend church services and frequently partake in the holy sacrament. The last day before she fell asleep, she was able to receive Holy Communion and holy unction along with the prayer of the holy confession. Her stay at the hospice was very short. She was blessed to have the prayer of the Trisagion be read for her shortly after she breathed her last. The following morning as we celebrated the Divine Liturgy to the honor of many great saints that she revered deeply; Saint Eutyhces the disciples of Saint John the Theologian, Saint Kosmas of Aitolia, and Saint Dionysios of Zakynthos, another Trisagion was read for her. Sister Monica was not sad or distressed about being called by the Lord from this transient life; rather she was thankful and encouraging her visitors to do the same and be happy. Sister Monica had made with our chanter Mr. Nick Panos arrangements to be buried at the monastery of Panagia Vlahernon. Saint Demetrios parish has been blessed with many hard working and dedicated faithful Christians during its history. Sister Monica (Vasiliki Panos) was one of these good examples in the life and the history of Saint Demetrios parish. Saint Demetrios is definitely a blessed parish to have people that look forward after living life of prayer and Christian service to standing in front of God after they depart from this transient life, and to meeting him and to ask him for his mercy and grace so that they can be saved. Peter and Ellie Bacopoulos celebrated on Thursday August 24th, 2107 their church wedding. It was a lovely service, warm, and graceful. Their Kombaros was Phyllis (Philomena) Hawkins who was very brave to attempt to learn the Greek Orthodox required actions of a Kombaros. Needless to say she did very well the blessings of the rings and the “Stephana”. The example of Peter and Ellie is very commendable. Even though they had been married civilly for a long time, they put a lot of effort to go through all the requirements and preparations (such as classes and paper- work) to prepare for their church wedding. One great thing about this wedding which is worthy of imitation is that everyone showed up ON TIME. This is an invitation to all of the couples within the church community that have not taken this step is to consider the example of this couple, and to imitate them. Please talk to Father Joseph about your church wedding if you have not done that. You may consider even talking with couples who had neglected doing the church wedding at the beginning of their married life, and ask them about their experience of having their marriage blessed by the church. The chance that you would hear some profound testimonies that could enrich your understanding is high. Congratulations to Peter and Ellie Bacopoulos on the church blessing of their marriage, may God grant them many more years together of happiness and virtuous Christian life. ANNUAL FANOUROPITA BAKE SALE Sunday, August 27, 2017 $15 a cake. Philoptochos ladies have secured Chef John Spirides’ s help to make fresh Fanouropita available for those that desire to obtain one. The feast of Saint Phanourios will fall this year on next Sunday August 27th. If you owe a Fanouropita to Saint Phanourios, or would like to treat someone to a delicious cake, give it as a gift or support the dynamic efforts of Saint Barbara’s philanthropic activities, please consider purchasing a Fanouropita. Quantity is limited. Presales are available by contacting Denise Brown 386-214-5126 or denise@southdaytonastorage.com. You can pick up your Fanouropita Sunday August 27th. Call the church office at 386-252-6012 for further information. In the ruins of an ancient church, icons were discovered in a state of decay, all except one, which appeared to have been painted the day before. This icon had the face of a saint with the name of “Fanourios” Drawn around the saint were 12 distinct frames in which Fanourios was shown enduring a cruel form of torture and this was a remarkable testimony that he died the death of a martyr. Fanourios, lost for centuries in the ruins of a church, became the patron saint of things lost. His name is invoked when prayers are asked for the recovery of things lost. He is commemorated on August 27, the day his icon was found. The ladies of Philoptochos would like to extend a heartfelt thank you and deepest gratitude towards all the help and support that was given towards our Panagia Luncheon. A special thank you to restaurants Greektown Taverna and Santorini for their generosity and continuous support. As well as Katherine Nicolaou, who made the delicious dessert in loving memory of her sister, Mary. This was a free-will donation where all proceeds go to our mission of assisting those in need. We greatly appreciate our Saint Demetrios family. We were delighted to see so many celebrating our Most Holy Theotokos. May our Panagia be with you all always. Sunday school team is in need of volunteers to assist during this coming school year on Sundays after receiving Holy Communion. If you are a High school graduate, enjoy working with kids, and willing to teach children, your talent will be put to good use. Training and materials will be provided. Last Sunday the blessing of back- packs and all students took place. The participation was impressive and students were eager to receive the icon of God’s Mother in order to place it with their books. We contin- ue to pray for the illumination of all students of Saint Demetrios, parishioners, and the entire world. Saint Demetrios parish welcomes its newest addition baby girl; a divine gift from God. Congratulations to Petros and Jennifer Kaniaris and their entire family for the birth of their most cute addition Eugenia Anne on the feast Day of Panagia. 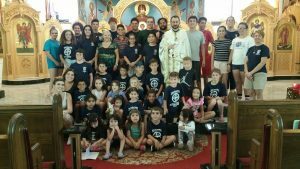 God has blessed Saint Demetrios parish with wealth of children and youth. Glory be to God for his mer- cy and abundant generosity. Forty days churching will take place on Sunday September 24th. Irene Panos the daughter of our chanter Nick and Vasiliki Panos has moved to a new place recently. Her new home is nice and her care is good. She will be missed during the church services, but will receive house pastoral visits to serve her spiritual needs. Please continue to pray for her and her whole family. Tuesday August 15th Luncheon in honor of the Mother of God after the Divine Liturgy of the Dormition of the Mother of God. Vessel of the holy myrrh: this is used during baptism services, and contains the holy chrism. Sprinkler for the holy water: this is a tool that is used whenever a service of blessing of water happens or during Holy Friday. Candles holders, Fans, and Cross: This set is used during processions carried by the altar boys. Hand-held in-censor: this is used during holy week and few other services instead of the swinging incensor. Set of crosses and candelabra for outside service table:this table is used during memorial services, wedding and other similar blessing type of prayers. This part is important as the items are closer toward the side of the congregation, and their defects are more easily noticeable. Holy Gospel/Epistle book cover: mostly all the holy gospel or epistle book covers are old or too worn out and can either use refurbishment or replacement. Two new sets of holy chalice made from silver are needed; one of smaller size for the size of Saint Phanourios chapel,and the second one for the main holy altar. Other additional needs that are not pictured are different set of fabric covers for the holy table to match the liturgical season with their matching colors of covers for the holy chalice. Newer sets of altar-boys robes are needed that has variety of colors for different liturgical seasons. Should you have an interest in donating toward any par- ticular item in part or whole, please let Father Joseph know. This list does not have prices attached to it as it is an arduous process to get final number. Quotes usually are good for short period of time. But a good faith estimate can be provided upon request. Who: anyone who is willing to teach children about orthodoxy and the faith. We need volunteers to help teach the Sunday school children about the faith. Thank you for the wonderful support that was expressed by Saint Demetrios parishioners last Sunday toward the gift of luncheon that was offered by the family of Chef Christopher and Panagiotis Karamitos family. The feedback was very enthusiastic and encouraging. This is one example of the many examples where opportunities become available through the generous spirit of Saint Demetrios parishioners to show love to God and to his church by creating opportunities for other co-parishioners to express their love in their own personal way toward God by supporting the Christian ministries at Saint Demetrios parish. Below is the registration form and calendar for the upcoming Greek School year. I’ve included both printable and online version of the form for your convenience. The plan of replacing the old liturgical items, obtaining the other needed items that have fallen out of use due to being worn out, replacing the altar boys robes, holy tables covers, and similar type items has started. The first items that are going to be blessed after the conclusion of the Divine Liturgy and put to use are three incensers that have been donated. Two of them are made of silver offered by a family from Saint Demetrios. The family was gracious to act quickly in advancing the funds in order to make the real good bargain happen. The purchase price of the two would have been under normal condition maybe enough only to purchase one piece. The third incenser was donated by relatives of John Spirides from Greece and was sent to Saint Demetrios with him during his visit this past summer. The current old incensers that had been in use until today will be retired. However, talking to the technician that mad the newly donated incenser, it looks like it is possible to refurbish them to extend their use. More information will be made available in regard to the replenishment of the litur- gical items, robes and fabric covers of the holy altars soon. If you would like to help with this project or any of the abovementioned items, please let me know. Please mark your calendar to set time aside on October 25th, and 26th in expectation of His Eminence Metropolitan Alex- ios’ arch pastoral visit to Daytona Beach for the celebrations of Saint Demetrios feast day. His Eminence Metropolitan Alexios looks for opportunities to increase his direct contact with the parishioners of Atlanta Metropolis by traveling thousands of miles each month across the Metropolis of Atlanta which is spread over eight states in the southern part of the USA. The vespers service will be held on the evening of the October 25th starting at 6:00 p.m. and will be followed by the usual reception organized by the ladies of Philoptochos. On the feast day of October 26th a luncheon will follow the hierarchal Divine Liturgy. Sponsorship and help is needed for this important function. On this day as well a memorial service is offered for the benefit of the founding fami- lies of the community and for all departed parishioners from Saint Demetrios parish since its start. Help is needed with the offering of the Koliva for this service. Parishioners that would like to offer an Artoklasia (five loaves) either on the evening of October 25th or the morning of October 26th are encouraged to contact the church office for this purpose. His Eminence will have time to visit with the members of the parish council, Philoptochos, ministries, as well as all parishioners on the evening of October 26th after the short vespers service that will start at 5:30 p.m. The plans are still at an early stage, and will be flushed out further as we get closer. However, it would be important to block out these slots on your calendar so that a meaningful discussion can be set for the benefit of all parishioners with His Eminence. Saint Demetrios parishioners have an opportunity to get to know our Father in Christ Metropolitan Alexios better on a personal level during this anticipated visit. Please discuss within your ministry team your desired plans, and let the parish council know or Father Joseph through the church office your thoughts and needs in order to give you as much space as needed for a successful and fruitful hierarchal visit. Thank you for your attention and for your support, and may the intercession of the great Martyr Saint Demetrios enrich and bless your life. Please accept my heartfelt prayers and sentiment of gratitude for all of your prayers and concerns that are being expressed in many ways during the difficult and challenging time of Phyllis’ son Justin passing away. Justin was a sweet and a wonderful young man (43 years). All who have known him came to love him and appreciate his kindness and gentleness. Justin lived in California but had a large circle of friends and business acquaintances in North folk, VA. There are many elements that are going to determine the place of his final rest, and other related details. Phyllis will share with us the final plan once it has been finalized. The office situation is stable, and Phyllis is taking it one day at a time. Through your help and support we will be able to meet the demand while giving her the needed time for grieving, travel, and rest when she needs. If you are in a position to offer few hours to be at the office to answer the phone when she needs to take some time off, please make your availability known to her, and she will call you when your help is needed. The final report from the medical examiner has not been finalized, however, a heart attack is suspected to be the cause of his drowning. Whatever the final report is going to contain, the bottom line is that this young man has been called by God from this life, and we at Saint Demetrios are the adopted family of Phyllis that will help her navigate through this major event of her life. Thank God for everything and under all conditions. Let us with one heart ask God for his grace and mercy to shower Phyllis and her family and aid them to lessen their pain and sooth their wound. Please continue your prayers for Phyllis and for Justin, as well as all that are suffering from the shock of Justin’s loss. May God rest his soul. The viewing will take place at PORT ORANGE Lohman funeral home located at 1201 Dunlawton Ave, Port Orange, FL 32127 on Sunday 7/9/2017 between 4-6pm. Trisagion service will be held at 5:00 p.m. The funeral service will be held on Monday 7/10/2017 at Saint Demetrios at 10:00 a.m.
Ted’s family has graciously requested that memorial donations in his memory be directed toward Saint Demetrios parish. The list of the different projects/items that are hoped to be accomplished or obtained for the benefit of Saint Demetrios parish was published last week in the bulletin. Should you want to obtain a copy, please do not hesitate to contact the church office at 386-252-6012 or email Phyllis at phyllis.hawkins@stdemetriosdaytona.org. If you have any questions in regard to any item or desire to help in anyway, you may contact Father Joseph as well. The list has various items addressing different areas with a certain sense of priority that is determined based upon a number of factors. All needs are important. Some are urgent, and others are less urgent but still needed. The parish council on a regular basis consults the list during its meetings, revises it, and looks for ways to balance it where urgent needs are met while other needs that must wait due to funding challenges do not reach dysfunctional con- ditions while awaiting for their turn. A Garden Tractor is one of the items on the list that is needed and would be a great help if obtained soon to the overall function and safety of Saint Demetrios custodians. One specific type has been determined as suitable to the needs of the Saint Demetrios church campus. 24 HP, 4 cycle & 2 cylinders. 724 CC with a fuel tank of four gallons. It has a starting system, and is capable of doing three cutting options side-discharge/bag/ and mulch. The engine is warrantied for three years. If you are interested to help in purchasing this tractor in part or whole, please speak to Father Joseph fatherjosephsamaan@gmail.com, contact the church office, or talk to Gary Koliopulos Gary at gjkolio@aol.com or any of the PC members. A kind, hardworking, soft-spoken, gentle man whose love for his church and family always came first. This is how many will always remember late Mr. Peter Tagalakis. A Sunday school teacher and spiritual educator to many within our community. He loved to teach the youth the importance of our faith and how Orthodox Christianity has preserved the original teachings of Jesus Christ and his apostles from that time until present. There was something about the tone of his voice when he spoke that you could feel the love, gentleness and purity exhibited from deep within. He mirrored Christ-like behavior. Late Mr. Tagalakis owned and operated Tag’s restaurant in Daytona Beach Shores where he, his wife, Stella and their two sons, Ted and Bobby all worked together. A place where many families would gather for a delicious gyro or chicken souvlaki… adding a taste of our culture to our community. Eventually, he and his sons would run the business while caring for Stella who grew ill from Cancer. This was a battle they all fought together as a family. Shortly after losing Stella in 1995, he became very involved in helping the monks and nuns at Panagia Vlahernon and Annunciation of the Theotokos Greek Orthodox Monastery, which was founded in 1998. Many would refer to the monasteries as his home away from home. He loved spending his time there. A peaceful spiritual haven. After his fall in 2014, he moved up north to be with his son Bobby and his family where he remained until his final days. Even in his last days on earth, his heart re- mained in his church as one of his last orders of business was to kindly donate his family cemetery plots to the Saint Barbara’s Philoptochos. The ladies Philoptochos of Saint Barbara at Saint Demetrios despite the limited resources of their chapter had been trying to figure out among many things a plan to obtain burial plots that can help grieving families with financial difficulties upon losing beloved ones.”At the moment when their wish sounded monumental and hard to achieve, but their desire was strong and faithful, God rewarded their desire when a letter came from late Mr. Tagalakis family indicating his wish to donate his family section at the Greek section of the cemetery to St. Barbara Philoptochos organization. 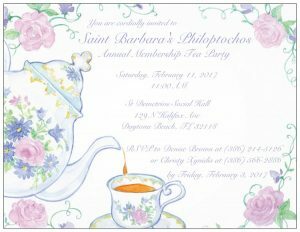 The ladies of Saint Barbara Philoptochos today are hosting coffee hour in thanksgiving to God and in honor of late Pete Tagalakis, they are also offering forty days memorial service in his memory to give an opportunity to the entire parish of Saint Demetrios to pray for the rest of his soul. Pete Tagalakis was buried at the Greek Orthodox Monastery of Panagia Vlahernon in the Ocala area on Saturday of souls just before Pentecost. Many parishioners from Saint Demetrios attended the funeral and supported his family. The write up on the next page was written by one of Saint Demetrios parishioners in recognition of the impact that late Pete Tagalakis has left upon the writer and upon other peo- ple as well during his years of service at Saint Demetrios, the writer kindly asked to stay anonymous. 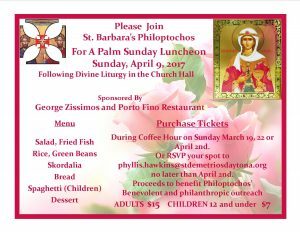 Next Sunday the Philoptochos of Saint Barbara is sponsoring a coffee hour and a forty day memorial service for the departed servant of Pete Tagalakis, a former parishioner from Saint Demetrios that served the parish in different positions and indifferent capacities. Please do not to miss this memorials service as St. Demetrios parishioners are the only remaining family members of the late Pete Tagalakis family in Daytona Beach. Our annual commemoration of the 4th of July, Independence Day in the United States of America, provides us with an opportunity to reflect on the blessings of liberty and to express our gratitude to our forbearers for the freedom that has been advanced and sustained throughout the history of this country. We have and experience a multitude of social, political and economic freedoms because many sacrificed courageously to protect the highest ideals, others engaged in challenging debate and decisions over the shape of governance and society, and countless more have cherished freedom by re- specting the rights and liberties of others. We are truly blessed to live in a country where our freedom to live, to move, and to seek unlimited opportunities represent the tremendous benefits and potential of a free society. As Orthodox Christians we are also blessed to understand this freedom through our relationship with God and the liberty we have through Christ. In his let- ter to the Galatians, the Apostle Paul affirms this connection: For you, brethren, have been called to liberty; only do not use liberty as an opportunity for the flesh, but through love serve one another (5:13). As people called to liberty, we see our freedom in this country as an opportunity for service. Our freedom is an opportunity to offer a witness of true and abundant life in Christ. In a free society we are able to go and share the good news of grace, salvation, and healing offered by God to all. We are truly free to give our resources and time to meet the genuine needs of others, using our liberty as an opportunity to serve one an- other. This is the blessing of liberty, and from the service we offer to one another more blessings will come through seeing lives transformed by the power of God’s grace. In your commemoration and fellowship on July 4th with your families and communi- ties, I ask each of you to reflect on your liberty and how your freedom is an opportuni- ty to care for and serve others. Consider ways you can offer service in the grace of God to your family members, coworkers, neighbors and others in need in your communi- ty. As people called to liberties that live in a free society, our service will lead to great and marvelous works for the honor and glory of God. Thanks are due to a large number of camp supporters that made summer camp this year another successful and grace-filled time. Thanks to all the donors that helped the financial needs of the camp. Your generosity was another excellent exemplary sacrifice. However, due to the passing away of some strong camp supporters, the funds that were collected fell short from their normal level. Some more help is still needed. Please help if you are able with any amount possible to cover a gap of about one thousand dollars. Thanks and greetings from the entire awesome summer camp team. P.S. You may not want to miss this Sunday on a presentation prepared especially for you by the summer camp children. See you at church on Sunday …. Every other year over than seventy Greek Orthodox parishes from the southeastern part of the United States gather together for the clergy and laity convention. Besides the clergy the convention includes the ladies of The Philoptochos society from the various parishes. This year there was an added blessing where the choir confederation became part of the convention thus making it possible for all the major elements that minister to the parishes to come together. This year the Greek Orthodox parish of the Holy Trinity in Raleigh, NC was the host of the convention, and the organizing committee did a wonderful job in taking care of all the related details of the convention. Saint Demetrios parish was represented by one of the younger parishioners; Tony Khoury a post graduate student from Embry Riddle University. Presbytera Linda represented the Philoptochos Ladies of Saint Barbara and received on their behalf the Zoe Cavalaris award of highest membership achievement for the past two years. The final day of the convention was concluded with a Divine Liturgy service with an ordination of a priest in the presence of more than two dozen other priests besides His Eminence Alexios and the other deacons. During the Divine Liturgy a memorial service was offered on behalf of all departed members and organizers of all the previous clergy laity conventions of the Metropolis of Atlanta which means that departed parishioners of Saint Demetrios were part of this occasion by being remembered and prayed for during the Divine Liturgy. The thank you note below is from one of our very own young parishioners that gradu- ated this year moving on to college. As you know, the parish council and the ladies of Philoptochos every year jointly provide the graduates with a set of gifts to help them in their transition to college life. This small yet meaningful gesture that is done with care and love does not go unnoticed. It does something to engrave in our children’s hearts a special place for their home parish. The following note is an example of the positive impact of the many things small and large that your support makes it possible to happen through the care of your ministry leaders and volunteers. Last Sunday Saint Demetrios witnessed an added blessing with the thanksgiving prayer for Stephanie Drymonis for her safe delivery, and a “Forty Days” blessing prayer for Elias Daniel Drymonis her newly born baby boy. Congratulations to Peter and Stephanie Drymonis for receiving this beautiful divine gift. Saint Demetrios parish is delighted to be part of this prayer service and along with the parents to lift up the grat- itude to God for all of his gifts, and for this beautiful child that is adding a wealth of blessings to the large family of Saint Demetrios in Daytona Beach, FL. Please see Father’s Michael Platanis letter addressed to the Atlanta Metropolis clergy advising them in regard to extending the deadlines of the Panagia Chapel submission of names by His Eminence Metropolitan Alexios in order to allow a little more time for more families that have not had the chance to send in their names. 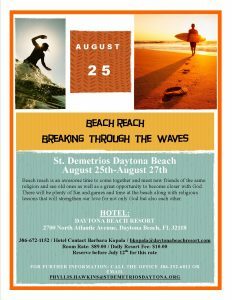 Please contact the church office 386-252-6012 should you have any questions or email Phyllis at phyllis.hawkins@stdemetriosdaytona.org with your names. Thank you to all the families that were able to become part of this wonderful project, and may God grant strength to the rest of Saint Demetrios parish that want to partici- pate but not have had the chance to tackle this project as of yet. Greetings. I wanted to thank you and congratulate each of you on your e orts to achieve a successful Panagia Roof Tile Campaign. In order to get even better participation, we are offcially extending the June 16 deadline to JULY 1. His Eminence is keenly interested in the progress and participation on of each parish. Please let your parish know that the June 16 deadline has been extended to July 1 and please use this time to reach out to your parishioners through every available medium and even through your phone commi ee to call parishioners who have not yet given their names. We are committed to achieving 100% participation… let’s con nue to give it our best. Thank you very much. I look forward to seeing you at Clergy Laity Assembly in Raleigh! To all of Saint Demetrios COOKS and KITCHEN support,The Goya Beach Reach Retreat is happening in August. Our youth are excited to be the host of a dynamic weekend during August 25-26 & 27 that is going to attract youth from across the different parishes of the Metropolis. Kitchen support and cooking teams are crucial element for the success of this event. Please contact the church office or respond to this email if you have any available time to offer help and support during any of the meals time. 3. and Sunday luncheon on August 27th. There is some help that has already been lined up to some of abovementioned events, but the full schedule has not been finalized and any kind of help is still welcomed. Thank you for your support to our youth and for helping to make Beach Reach Retreat another unforgettable memory. The utmost gratitude and thankfulness are due to the entire parish of Saint Demetrios from Presbytera Linda and my family for the generous help and tremendous support that have been shown through the attendance of the parishioners of St. Demetrios on the special occasion of Father’s day. Your thoughtfulness and care made this event a happy and joyous day. One could not but feel the vibration of the joy that filled the church hall. Watching the children on the stage performing so beautifully, hearing the laughter, and watching everyone enjoying their time was the most rewarding part of the day for us. We will carry this sweet memory in our hearts for many years to come. Organizing an event of this size would not have been possible without the loving efforts, caring touch, and great sense of dedication felt by a large group of volunteers from Saint Demetrios parish who went beyond the extra mile to help, support, and outdo themselves as an offering of love to God and to his people. Gratitude is owed to the large kitchen team that worked well under Katherine Nicolaou supervision offering a very classy service and wonderful meal, the decorating team that made the church hall a gorgeous place, and the Sunday school team that organized a very cute children presentation. With your help being inspired by our Lord and God Jesus Christ our Saint Demetrios parish is able one more time to help in perpetuating the work of the grace of God, the values of our church and her holy heritage to impact with love the lives of many people at the Diakonia Center. Children, adults, families with children of special needs, Philoptochos ladies, ministries leaders, and priests from across all of the parishes of the Metropolis of Atlanta are getting to meet each other and establish lifelong bonds through the Diakonia Centers various programs. Thank you for being part of this great mission, an integral aid in spreading hope, peace, and joy in this world, and thank you for being an enthusiastic helper in watering the seeds of the faith that sprout in the hearts of many God loving people. I appreciate all of your personal and meaningful gifts to me. I will cherish them very fondly with an acute sense of appreciation and gratitude. The coffee hour on Sunday after the Divine Liturgy is an excellent opportunity for St. Demetrios parishioners to get together and share fellowship. This gathering is really important especially if you take into considera- tion that it is difficult for all of us to get together during the weekdays, or visit with each other as often as we wish. Please consider hosting one Sunday a year where your family along with some of your friends can co-sponsor one Sunday. Please see the five available dates below starting next week that need your help. Parishioners from the various parts of the Saint Demetrios parish surprised Eugenia Sarpakis with a delicious German chocolate cake on her 101 birthday on June 20th, 2017 at her home. May God continue to bless Eugenia. She has many interesting stories about her dad and her family involvement with church life. Eugenia had a wonderful time with the visiting ladies and thanked them for their thoughtfulness. Thanks are due to the large number of parishioners who cooperated and coordinated this visit. It is a commendable initiative and reflects the healthy level of care within the parish and toward one another. The efforts of the PC through the grace of our great God Jesus Christ and through your support and generous contributions continue to beautify our church campus and upgrade many necessary needs.The project of cleaning and painting the storage building across the street in the parking areas has been completed. The project of fencing the parking area is in progress. The permit has been obtained from the city, and the preparatory steps are being implemented as needed. Please continue to pray for the progress to go as needed and for the church campus to look more beautiful and more appealing. There are others ideas that are being currently discussed. Nurse Nicole and her peers had given one of Saint Demetrios parishioners extra care during their hospitalization. In gratitude to her attentive services, the crochet group and Philoptochos ladies provided Father Joseph with a prayer shawl and baked goodies along with a nice card to take to her. A Huge thank you to Nicole and through her to all the nurses and the medical staff at various medical centers in the area that several of Saint Demetrios parishioners are admitted at times to their care. Thank you to the ladies of the crochet group as well as Philoptochos ladies that make these gifts available to be provided either to parishioners at hospitals or to the medical staff that take care of them as a gesture of gratitude. Thank you for your support over the past years that made it possible for the Diakonia Center project to keep moving and to reach this point where many wonderful things are happening, with more plans on track for the near future. Any financial support that you may choose to offer in honor of Father’s Day would be crucial for the Diakonia Center and will make it possible for existing programs to continue to enrich the lives of youth and adults alike. services. “When people retire they should not just wait to die” as His Eminence emphasizes time after time when he meets with his clergy. Diakonia Center is a project that is envisioned to bring renewed energy, transformation, vibrant church life to many people who might have worked very hard to raise families and provide to others, and the time has come for them to take care of their own souls by spending more time in prayers, contemplation, church fun activities and daily prayer services. May God bless your life and the lives of other exemplary role models, and have mercy upon all his righteous people that have fallen asleep that made it possible for all of us to receive our Christian faith, and hand it down to the next generation. The church school year has come to its final day this year. The Saint Demetrios children of the Sunday school as well as the Greek school have enjoyed their final happy moments this past week. Thanks are due to all parents, volunteers, teachers, donors, parishioners, and sup- port staff that helped in various capacities that made this year fruitful and successful. The summer break is meant only for a time of planning and regrouping to start a new and fresh year in September and to continue to help the youngsters on their path to get to know God deeply and in a personable way. May God continue to strengthen and bless all selfless and God-loving youth workers who express their love by being present as a support in the life of Saint Demetrios youth groups in whatsoever they can help or put their skills to good use. Congratulations to Pete and Stephanie Drymonis on the birth of their son Elias Daniel on Sunday the feast day of Saints Constantine and Helen. This is another joyful and happy addition to Saint Demetrios large family that will add to the wealth of the life of Saint Demetrios parish. I’d like to say thank you so much for a wonderful luncheon/ceremony yesterday. I can’t begin to tell you how much my family and I appreciate your show of support to all our graduates. Thanasi, Dimitri and I went through the gift packages and I was floored. That is an amazing, touching and very meaningful gift. You and the ladies out did yourselves. I couldn’t believe all the things you thought to include, from the tray to the candles/sand, books, icons etc. Love the container to keep it all neatly together – very user friendly for our kids on the go :). What a beautiful way to show love, support and continued connection to our church’s children! That they are able to keep our church close, while they begin their new journey, is a life line beyond measure. You and the ladies are such a blessing to all of us. I say thank you with my heart full and a tear in my eye. Thanks are expressed to all the teams of volunteers that stepped up to help with supporting of the Calamari booth at the Fiesta of our Lady of Lourdes Catholic church this past weekend. It was wonderful seeing all the smiley faces that had fun bringing joy to others and frying calamari. vGreat job in representing Saint Demetrios of Daytona Beach to say thank you to our Lady of Lourdes parishioners and to Father Phil for the gracious help during the Greek Festival and for allowing Saint Demetrios guests to park their cars while taking the shuttle to come and enjoy our Festival. Happy event with the Luncheon sponsored by AHEPA Daytona on Sunday May 7th at Saint Demetrios Greek Orthodox Church in Daytona Beach, FL. Marisa Kometas; AHEPA Speedway Chapter 410 Scholarship. Tia Klironomos; Steno Augustine Memorial Scholarship & Daughters Sybils Chapter 343 Scholarship. Sotirios Lyrintzis; Dino Rizopoulos Scholarship. Georgia Paspalakis; AHEPA National Housing Scholarship. On behalf of Karamitos family, my Presbytera Linda and family, I wish to express the deepest gratitude toward all the help and support that was given towards the Mother’s Day event by the parishioners of Saint Demetrios family. Your participation, wishes, support through various way, and donations were very generous and thoughtful. The smiley and happy faces of the kitchen help was awesome and heartwarming. Thank you for your prayers and heartfelt thoughts. This happy day gave the opportunity for Sunday school children from Saint Demetrios parish to learn about motherhood, and to share their learning with all of you. Their readings and poems at the event were meaningful and thought provoking. Thank you for the positive feedback and gracious comments that were expressed about the children’s program, and thank you for giving them a friendly audience to open their wings. Even though the path toward replacing the AC unit of the church hall is a long one, your generous offerings in memory of Nikolaos Karamitos and in honor of Presbytera Linda has brought Saint Demetrios one step closer toward this goal. May Jesus Christ pour his abundant mercy upon the souls of his departed servant Nikolaos and family. May God bless your efforts, and reward you with his divine blessing, and thank you for your love and care. Honoring our Graduates on Sunday May 21, 2017 after the Divine Liturgy Saint Demetrios will be honoring our graduates who are in attendance with a special prayer and parting gifts. The Daughters of Penelope Sybils Chapter #343 will offer the Christine Samaras Memorial Scholarship to one worthy female student. Scholarship applications are now available at the church office and the deadline is May 1st. The Saturday of April 30th was the Metropolis of Atlanta Oratorical Festival. It was held at Saint Demetrios Church in Fort Lauderdale, FL. The event was another inspiring and divinely inspired gathering. As usual children that have come from the different churches across several states spoke well and from the heart. Their words were genuine and touched the hearts of the audience. Our Saint Demetrios parish was present there through of one of the speakers from the junior division; Michael Bramblett. Our conference was represented by other speakers from our surrounding communities. Thank you again is expressed to all of you that have helped and supported this educational element of our parish life and youth programs through various ways and means. The support of the Oratorical festival on the local level by each parish and by Saint Demetrios makes it possible for these wonderful gatherings to enrich the life of many parishioners and youngsters, and inspire them on the path of God and his salvation. If you care about the well being of your heart, you are invited to attend a presentation from one of the top cardiologists in America. Learn about the latest advancements in cardiology and heart wellness. Saturday May 6th From 12:00 p.m. till 10:00 p.m. (total of 4 people are needed. Sunday May 7th From 12:00 p.m. till 8:00 p.m. (total of 4 people are needed. As you are aware PARKING during the Greek festival of Saint Demetrios is one of the most major challenges; Lady of Lourdes church graciously allows Saint Demetrios festival guests to park their cars at their parking lot, and use the shuttle provided by St. Demetrios Greek Festival at no charge to come to the Greek Festival. This is a tremendous help!! Saint Demetrios Festival Committee always reciprocates the gratitude of Saint Demetrios parish by helping out during Lady of Lourdes fiesta frying calamari at the Calamari booth. It is fun time!! If you are able to help in solving the Greek Festival parking challenge, please give 4 or 5 hours of volunteering time according to the schedule above. Pete Perakis who has volunteered at this booth for the longest time will train you; please contact: Billy Gahagan at wmgahagan@gmail.com, or call church office at 386-252-6012. Holy week is usually an intense marathon of prayer services and preparations for the services themselves. Actually it lasts more than a week, and it does not end with the coming of Pascha. Through the grace of God, your love, dedication and hard work we have been blessed with a wonderful week that brought with it tremendous divine grace from the throne of the Crucified and Risen God Jesus Christ. Despite a busy time leading to Palm Sunday luncheon and all the preparations that were needed during the days before, the church was made ready for the prayer services that started on the evening following the end of Palm Sunday service and luncheon. provide for the needs through your help and commitment. It is humbling and inspiring to have witnessed your love in action, and through your dedication God performing miracles. The number of parishioners who were able to stay for the Divine Liturgy of the Anastasis was very impressive despite the late hour of the service. The at- tendance for the Magiritsa after the end of the Divine Liturgy was a record number, and the compliments for the chef were plentiful, gracious and encouraging. After the agape service on Sunday afternoon, Saint Demetrios opened its doors for the neighbors to enjoy a Pascha meal in the name of the Risen Lord Jesus Christ and as an appreciation for his free gift of salvation. Help was more than adequate, the meal was delicious, guests number was higher than before, and the thank yous were genuine & heartwarming. We continue to enjoy the festivities of Pascha, the king of all feasts, our liberation from the slavery to death, and passage to life. We continue to sing Christ is risen, and greet each other with the greeting of the angels who broke the news to the myrrh bearing women. This greeting will replace the hellos and good mornings or precede them until the day of the feast of the ascension as a joyful celebration of the victory of Christ over death. Thank you for all of your hard work, dedication, and gracious initiatives. Every piece of work done from your end adds unique beauty to the whole mosaic of the church life and powerfully impacts the life of an unknown number of souls.May the joy and jubilation that stems from the empty tomb of Jesus Christ bless your life and inspire you, filling your life with every needed grace and healing of soul and body. For many years the late Mike Forest handled the “Food Bank” project. Once a week, every Tuesday or Thursday the nonperishable food that is blessed on Sunday is tak- en to the Lady of Lourdes church food bank. Vasilis Leboukas had stepped up and took care of this task for the past four or five years after Mike’s illness prevented him from carrying on this ministry. Another volunteer is needed now to continue this ministry without interruption so that Saint Demetrios parish can continue to support the needy of the neighborhood. If you are interested please see Father Joseph for further details and the different possible scenarios where you might be able to be a part of this worthy and rewarding ministry. Thanks are due to our great God for pouring his mercy and generous spirit upon his vineyard of Saint Demetrios. Volunteering and helping is an amazing part of Saint Demetrios parish. The load of organizing the needs of holy week season came together in a wonderful way. Saturday of Lazarus was a great day for children and parents. Making of the palm crosses while enjoying a delicious pancake breakfast, decorating the church, getting it ready for Palm Sunday were a few of the things that took place. The Philoptochos ladies did an awesome job putting together a luncheon that served close to 180 people with great coordination and a wonderful sense of service and dedication. The church hall looked beautiful, the food was plenty and delicious, help was more than adequate, children had the opportunity to enjoy many fun activities, smiles and jubilation filled the entire atmosphere. As I write this Paschal message, I am confronted by the fact that this undoubtedly beautiful day of fellowship and love which acts a foretaste of the eternal banquet in God’s Kingdom can seem at odds with how humanity treats one another. I especially am thinking of our Egyptian brothers and sisters, whose Palm Sunday liturgies were disrupted by violence and death. In the face of such horror, one might ask: how can we hope? Theologians have greatly discussed our Lord’s cry on the Cross, “Eli Eli lama sabachthani?” “My God, my God, why have you forsaken me?” For some, the very idea of Christ, the Son of God, addressing His own Father in such a way is deeply dis- turbing. Yet what is beautiful about this moment is often missed. Christ is not speaking for Himself He is quoting the Psalms. The speaker of this particular Psalm is in pain; abused and at the mercy of those who seek to destroy him, he calls out to God to deliver him from his torment for, as the Psalmist later says, “He hath not despised nor abhorred the lowliness of the poor; neither hath He hid His face from him; but when he cried unto Him, He heard (Psalm 22:25). My brothers, for this Feast of Feasts, let us never forget that the pain, sorrow and suffering of this world, however immense, are temporary. Christ has vanquished Death! His earthly life and teachings act as a guide to help us attain eternal life, while His Resurrection is the key which has allowed all of us to finally reenter Paradise. As we prepare to receive the Paschal light during this year’s Anastasi service, let us remember the Myrrh-bearing women, who went to the darkened tomb to weep over the sorrows of this world and instead saw the most life-affirming mystery; a mystery and wonder which granted light to all, proving once and forever that“…the kingdom is the LORD’S!”XPIΣTOΣ ANEΣTH! Christ is Risen! However, we live in a world where the mass media of communication constantly transmit misfortunate news about terrorist attacks, local wars, destructive natural phenomena, problems of religious fanaticism, hunger, the refugee crisis, incurable diseases, poverty, psychological pressure, feelings of insecurity and other similarly un desirable conditions. Despite its daily crosses and sorrows, the great Mother Church of Christ exclusively and solely experiences this phenomenon of joy. It experiences – from and within this life – the heavenly kingdom. From this sacred center of Ortho- doxy, from the bosom of this martyric Phanar, “on this effulgent night,” we proclaim that the extension and purpose of the cross and all tribulation, the resolution of all human pain and suffering, is the Lord’s reassurance: “I will not leave you as or- phans.” (John 14.18-19) “Behold, I am with you all the days of your life, to the end of the ages.” (Matt. 28.20) This is the message that all of us should hear, that the con- temporary world should hear in order to surrender to and discern Christ on the road to Emmaus. Indeed, Christ is beside us. And we shall see Him only if we hear and ex- perience His word in our life. I greet you with love and joy in the name of our Lord and Savior Jesus Christ! I pray, as we arrive at the end of our Lenten journey, that the remainder of this holy season will be a spiritually fruitful period in your lives. Coming, as we are to the end of the Great Complines, the Pre-Sanctified Liturgies and the final Salutation to the Theotokos with the Akathist Hymn, I hope that you took the opportunity to attend these beautiful services, which serve as vital connections to our Creator, and will give us the strength needed to em- bark upon our journey with Jesus Christ through Holy Week. For Holy Week, my beloved, is not simply a historical commemoration of Christ’s life-saving Passion and His loving sacrifice. However ornate and theat- rical our rituals may seem to some, we are not audience members or observers we are meant to be equal participants! How then can we truly feel connected to our fellow members of the Body of Christ, if we are not present to take part in the λειτουργία, the work of the people? I thank God that, here in America, we have been blessed with a new, modern translation of the Holy Week services, which allows us every night to join with the priest and the chanters, so that we can truly understand and feel the meaning of the words. Every service of Holy Week exists for a unique reason, and I pray that you will find time and not miss any of these spiritually renewing moments. Who knows, after all, if we are going to be blessed with another year to celebrate the services of Holy Week? I thank God therefore, that he has given us all another year of health, to join our brothers and sisters in Church. fellowship of Pascha with all our bodies, minds and souls! Looking forward to this Paschal spirit of love and fellowship, I would like once again to thank you all for your loving-kindness towards the clergy, and your brothers and sisters, as we are all members of the Metropo- lis of Atlanta family. Know that I pray for you all, and I ask for your prayers and forgiveness as I travel to various communities during Holy Week to spread the Gospel of Jesus Christ. God bless us all, and Kαλό Πάσχα! neighbors and a wonderful blessing to our church community. They keep watch over the church building when no services are taking place. Sarah recently survived, miraculously, an unfortunate car accident. Several parishioners and ministries groups have reached out to Sarah showing her care and kindness. Sarah was gracious to express her gratitude through a beautiful thankyou note. Her note is being shared with you today. Thank you for your initiatives, care, and love. Thank you and your family. Thank you Phyllis Hawkins, Angie Forest, Lisa Psaros and also to The Ladies of the St. Demetrios St. Barbara’s Philoptochos Society. I felt your prayers and encouragement. Your caring and kindness was so appreciated. Congratulations to the awardees of 2017 Archangel Michael Award of the Metropolis of Atlanta, Maria Augustine and Ted Nikolla. Once a year parishioners from St. Demetrios nominate their exemplary servants that demonstrate selfless and dedicated service to God through their local parish for the Archangel Michael award. This is a recognition award that is bestowed upon all honorees of the Metropolis of Atlanta during the Archangel Michael Celebrations; two parishioners from each parish. The selection at Saint Demetrios takes place at the end of the Divine Liturgy through prayers. Even though there are many worthy names on the list, only two are selected. 2017 honorees are dedicated parishioners of Saint Demetrios. Maria Augustine has a very long history of dedicated service through many dif- ferent ministries, tasks, and events that cover a wide range of the rainbow of services at St. Demetrios. that make this parish a vibrant vineyard of the Lord. 2016 Archangel Michael Award was bestowed on Maria Karris on behalf of His Eminence Metropolitan Alexios this past Sunday. Maria and Pete Perakis were the 2016 honorees. May God strengthen them and bless their ministry and the flame of God’s love in their hearts and souls. Thanks are due to all the campers of Saint Stephen summer camp SC who provided warm and hospitable coffee hour and great promotional presentation this past Sunday. Children worked diligently with their parents to provide humorous and happy videos. St. Stephen campers made this day a time full of energy through their presence. Families made the coffee hour rich and laden through their offerings. Your donations toward scholarships were a great gesture of love, care, and generosity. The cooperation of all parents, campers, and parishioners was very inspiring. Saint Stephen Summer Camp registration opens up this week. Please contact Father Joseph at FatherJosephSamaan@Gmail.com in case you need discrete help with your children to attend. Children that are going to be in 6th grade in September are eligible to sign up. This is the time of the season where for five consecutive Fridays (March 3rd, 10th, 17th, 24th, & 31st) a service is offered to the honor of the holy Mother of God Mary the Ever Virgin. The service is called the Akathist Hymn. Please let the church office 386-252-6012 know if you are interested in donating the flower decorations for the icon of the Mother of God that will be used on one of these Fridays either in whole or in part. Help is needed to man the parking lots during Bike Week from March 10th until March 18th for the Bike Week Parking. Any volunteering hours (Day or Night-Weekdays or Weekends) will be greatly appreciated. Please see George Karamitos george.karamitos@mauinix.com, Gary Koliopulos gjkolio@aol.com, Billy Gahagan wmgahagan@gmail.com, or call the church office at 386-252-6012. This year as it has been in the past two years an invitation has been extended by the parish council to invite Gianni, a guest chanter from Thessaloniki to be with Saint Demetrios during the special season of the Holy Week. Gianni’s cost is completely funded by your generous donations. A holy week wish list will be mailed out soon with a return envelope. Please return the envelope with your donation in any desired amount toward any of the available items or toward the chanter fund. Please make a note or call the church office 386-252-6012 should you want your donation or your name be known to Gianni as one of the donors. The names of desired parishioners will be made available to Gianni. Should you want to host Gianni at your home, please let Father Joseph know to work out the details with the Parish Council fatherjosephsamaan@gmail.com. Again thank you for all the care and love you show in many ways tangible and intangible. Looking forward to another wealthy year of divine grace poured richly during the special season of Great Lent and Holy Week. Every two years the leading positions of the ministries at Saint Demetrios are open for renewal and new appointments, by the Parish Council, for desiring parishioners to submit their names as potential candidates for one particular ministry. This rotation cycle is envisioned as a necessary tool to cultivate many leaders and to allow the movement of experienced leaders from one ministry to another. The appointment of the Ministry Leaders will be made by the Parish Council, unless that ministry already has a governing body such as Philoptochos and VIP club. Those ministries will then vote for their own officers and leaders. Please let the Parish Council know by April 30th, 2017 through Demetrios Mahairas at flbruin@bellsouth.net if you are interested in leading a ministry or to shadow and train with a current ministry leader. All current ministry leaders are encouraged to submit their names for consideration as well. This year’s positions that are open for renewal are as follows: Book Store, Choir, Goya, Greek Festival, Greek Dance, Festival Church Tours and Sunday School. “It is more blessed to give than to receive” (Acts 20:35) Saint Isaac the Syrian states that achieving knowledge of oneself is a greater achievement than the miracle of raising someone from the dead. This is one of the goals which the holy Church had in mind when she designated the Great Lent as a special time in the year for an important spiritual journey of self-discovery and repentance. As it is important for each Christian faithful to obtain the virtue of self-knowledge during the spiritual journey of Great Lent it is also appropriate for every church community to exercise the virtue of self-discovery and learn about its assets as well as its weak pointes during this spiritual journey. The prayer services and other available tools during this special season make this process encouraging and uplifting even when shortcomings and or devastating faults are discovered to exist within one’s self. The divine grace of God which is at work within the human soul during this sober time of the year makes the journey of self-knowledge more graceful and a less punitive process to the person that has chosen to embark on such a delicate travel. Saint Demetrios parish has been a live community without any interruption through the line of its life for more than sixty five years. It still has many of the families that go back to the first days of its formation. The same thing is true of the families that have come afterwards, and were an instrumental part in the church building process or its growth and expansion, or even others who have moved to this area and became an integral part of this family and have continued to be an asset in sustaining the parish family life through their presence, talents, and giving. This means that Saint Demetrios has a significant sense of an inter-generational commitment and loyalty to the mission upon which the foundation of the community was laid, and the mission of salvation as brought by God the Lord Jesus Christ. The slope of the growth line in the various areas of its life is still in the rising direction over these past decades even if the community at times had faced challenges or setbacks. Many of the desired projects or ideas that had been conceived in the past have eventually come true, and are no longer just a mere idea rather they have become a marked off accomplishment in the history of the parish community. All the above mentioned elements and many other elements as well constitute significant points of strength that make communities continue to live and prosper. On the other hand there are some elements that can use some adjustment or practices that should be revised. These practices did not necessarily constitute negative or failure in the past, rather they might have served a purpose but are in need of updating or upgrading to keep up with the changing times or newer living circumstances. One of the examples can be found in the annual budget and the giving pattern of parishioners. The current giving pattern prevents the church community from achieving a quicker, wider, and deeper growth in many necessary and vital ministries that could provide benefits and help to many people within and outside the church community. In a nutshell, the current existing giving pattern is short about fifty percent from the level where it should be. The basic cost of maintaining a place of worship, an infrastructure for the community gatherings for social or religious functions, and for other educational necessities is not fully provided for through the stewardship offerings. But, instead it is being subsidized about fifty percent by outside donations. It might be true that the bottom line evens out at the end of each year through donations coming from other regular or extra fundraisers; however the end result is that this pattern continues to cause a perpetual dragging force that always keeps the church community projects behind, delayed, or even to never see the light when the chance is missed due to the lack of funds that should have been there at the opportune time but were not available and the opportunity was missed for good. It is true that parishioners regardless of their stewardship giving respond quickly to specific needs or urgent maintenance projects requests. During the past few years there have been various needs that presented themselves during some of the most challenging economic periods where immediate actions were a must within a very short window of time. The response was positive, immediate, and effective. The projects that are being alluded to were achieved through good size donations in lump sums by a large group of parishioners. However, for example, if a onetime lump sum donation in the amount of one thousand dollars that was donated toward one of these urgent fundraising campaigns instead was given on a weekly basis, it would have been in the amount of a twenty dollar each week. This simple adjustment would have caused a significant decrease to the currently challenging financial drag. The need is there for an adjustment to depend less on special or urgent fundraising campaigns, and to depend more on smaller but regular giving. The budget style “Feast or Famine” when it comes to a church community cash flow is among the worst styles for church growth. It does not bond parishioners tightly with the life of their parish, and it does not provide equal opportunities for parishioners to grow spiritually through the virtue of giving. Please pray in your heart for God’s illumination to talk to you about what you can do to grow in the virtue of giving and reliance on God’s care and mercy. Please consider revising your giving style from an occasional one time large lump sum into smaller but steady weekly, biweekly, or even monthly basis. The drag force of the annual budget is the last remaining obstacle that is preventing your parish community of Saint Demetrios from rising highly and shining brightly as a beacon of faith, hope, and love within its surroundings. Working together to defeat this last obstacle means that the foundation of another stage of growth and spiritual prosperity can start and another series of ministries and essential projects can see the light for your benefit, your children and grandchildren, as well as for many other people, HERE and NOW. Thank you to everyone who attending the Daughter’s of Penelope Annual Wine & Cheese Membership Event on February 10th! Over 26 ladies attended and 5 new members joined our chapter! If you weren’t able to attend but still would like to join our group, which raises money for Scholarships and other charities, please contact Eleni Pitenis (386) 299-6522. We meet at the AHEPA Apartments on the first Wednesday of every month from 6-8 PM for dinner and meeting. To all students interested in this scholarship application. Please be advised that April 17th is the due date for consideration. Congratulations to Marilyn Formicola, John Koulouris, Dino Mosxos Paspalakis, Nick Trastelis for taking the affirmation and for the start of their service as part of the parish ministry. The OCMC Orthodox Christian Mission Center has celebrated 35 years of mission work on Monday February 6th at its new building just off the I-95 highway in Saint Augustine. His Eminence Archbishop Demetrios of America has come for the sake of attending this milestone celebration. The day started with a glorious Divine Liturgy where seminarians from the Holy Cross School of Theology have come from Boston and were chanting as Archbishop Demetrios presided over the divine service. The celebrations continued at OCMC center with a reception and several nice presentations by various speakers about the start of the mission work and the progress of OCMC from infancy into this current stage. His grace bishop Dimitri of Xanthos spoke about the starting years of the mission center. His grace bishop Gregorios spoke about his experience as a missionary to Alaska. Fr. Martin the director of OCMC spoke about two inspiring verses from the Lord’s Prayer and related them to the missionary work. His Eminence Archbishop Demetrios spoke about the early years of missionary work in Greece and related memories from his years as a student in the school of Theology in Athens along with Archbishop Anastasios of Albania and how they were inspired by the missionary work. The missionary work of the Orthodox Church is definitely growing; more parishes and parishioners are paying more attention to it, more support, and definitely more involvement. The parish of Saint Demetrios is very privileged to be such a close distance to OCMC. Please see Gus Pogas if you desire to place a canister in your shop where the offerings can help support vital mission work. Markella Balasis works for OCMC and can be another resource of information if you are looking for ways to support mission work. Philoptochos ladies always supported OCMC mission work and they can be also a re-source of help should you have any ideas that you might want to coordinate with them for the support of OCMC. Please see Raven Kastis to discuss your ideas. Oratorical Festival 2017 is right around the corner and we are trying to get the speakers ready so that Daytona will be ready to represent their parish!! Our local festival is going to be on March 5th, which happens to also be Sunday of Orthodoxy! What an awesome day to have our children speak!! Also, we are having a SPEECH WORKSHOP on Sunday, February 19th! We are asking that the speakers come ready with their speeches so that we may help with any changes needed or adding/taking away material based on time , etc… we are not WRITING SPEECHES on this day. Please motivate your children to be ready for this day, we will begin after coffee hour in the hall. This past weekend the Saint Photios National Shrine cele-brated the 35th anniversary of its dedication as a Greek Orthodox center in the heart of Saint Augustine. Saint Photios has managed over the past decades to provide a ministry for Orthodox people to get involved in the service of outreach, and go beyond the walls of their parishes. The commemoration of Saint Photios feast day is an opportunity to reflect on the genesis of this ministry and its progress. During this weekend the full board of Saint Photios Shrine nationwide would convene. Interestingly, the general counsel of Greece, Adamantia Klotsa, located in Tampa dedicated her weekend to be part of this important institution. Representatives from all the Metropolises come to Saint Augustine as well as from Philoptochos, Daughters, and AHEPA. His Eminence Metropolitan Alexios diverted his route from his travel to one of the parishes and made a stop in St. Augustine to come to the meeting. His grace Bishop Gregorios Tatsis from the Carpatho-Russian Diocese of America was the keynote speaker. Youth from local parishes spoke nicely about the significance of the shrine. Parishioners from St. Demetrios and other parishes far and nearby came together to enjoy a delightful luncheon. 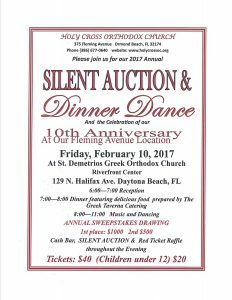 Many parishioners and businesses from St. Demetrios have donated generously toward the silent auction that filled the “I love Daytona Beach” Basket which happened to be one among the baskets of highest value. The entire weekend was another grace-filled event, and wonderful reunion. Polly Hillier the director of the shrine, has worked very hard with her aids to bring the event to fruition in such a dignified manner; donors and volunteers sacrificed generously time and treasure, and the grace of God rewarded this effort with divine presence and joy. Looking forward to next year’s presence and participation from a wide circle of St. Demetrios parishioners so as to enjoy this special, happy, and unique days and celebrations. Saint Sophia Trust, the gift of God through the Forest Family has transitioned to the possession of Saint Demetrios parish, and since then it has acquired its own trustees as it was envisioned and set up by Angie and Mike Forest. The current trustees in addition to the priest of Saint Demetrios consist of the Parish Council President, Jim Mahairas, Tas Coroneos, Faye Louras, and Marilyn Formicola. The trustees have had several meetings and discussed many important and needed steps in order to deter-mine how to meet the current needs of this house and its best future use. The trustees are currently occupied with several logistic needs that are time sensitive. This includes insurance matters, zoning, assessing the needs of the building, and ensuring that other safety steps have been put in place. Later the trustees will be work-ing on a system to evaluate the different suggested uses and ideas that are brought up by the parishioners that are intended for the future use of the house. Please feel free to send any and all of your suggestions to Father Joseph at fatherjosephsamaan@gmail.com in regard to a proposal of future use of the property next door. The project of church building repairs has started after some delay. The delay was caused mainly due to an uncertainty in regard to what repairs were needed. The parish council over the past few years went through many studies by different expert opinions in order to get a list of suggested repair plans. All the different paid studies and other engineers that were brought in by several concerned parishioners agreed in general that the damage was being caused by the intrusion of water. Also the good news was that the preliminary guess of the engineers pointed out that most likely the damage was only exterior, and most likely did not cause any foundational damage. The studies recommended repointing and sealing of the bricks as a first step of ensuring that no water intrusion would happen again before moving to the next steps of repairs. Once it is certain that the water intrusion has been stopped, other steps would follow to repair the current damage that has happened mainly in the holy altar area. We continue to pray to God to make this process successful and effective. Thank you all for you concern and help, and many thanks to all parishioners that have helped over the past couple of years in so many ways to clear the puzzle in regard to the needed repairs, and for helping the PC to reach this point of taking actions with more confidence. and certainty, and to resolve this issue for good. Congratulations to Roland Szabo and Dina Boris on the baptism of their baby daughter Sophia Allison. God parents were John Loudaros and Julia Strati. Sophia was born in September last year, and has been a wonderful addition to the youngsters of Saint Demetrios parish. Sophia is another Sunday school child and future Greek dancer in the making. Glory to God for the wealth of his gifts and for blessing Saint Demetrios parish with so many young children. It is an absolute joy to work with this young life, and bring to them the message of peace and salvation of Jesus Christ. Congratulations to Vincent Constantine (Kosta) Sanitate on his reception into the Orthodox Church through the holy sacrament of chrismation this past Sunday. Sponsors were Jim and Eleni Pitenis. Vincent has always come together with his wife Despina to church services at Saint Demetrios and other celebrations and other occasions. Even at the few times when Despina had to travel to care for family and he stayed behind, Vincent would come alone to Saint Demetrios Sunday services. Interestingly, Vincent is of Italian background that grew up in Greece before World War II, and that is how he spoke Greek and was exposed to the Greek culture. The invasion of Greece by Italy caused his family and other Italians at the time to move out of Greece after the war. We pray for his strength and spiritual progress, and for him to continue his walk with his family on the path of the Lord blamelessly in a manner pleasing to God Jesus Christ. When Michael Forest closed his eyes on this earth, I personally lost a dear person, a parishioner that was a fan who always cheered and lit up with joy when he used to see me. Mike always made me feel that my visit to him brought him delight and happiness. Mike was an energizer that made me feel excited about the importance of visiting the shut-ins, people at the hospital, parishioners at home or at work. He kindled and rejuvenated my interest and enthusiasm to carry on with this important ministry. Mike opened my eyes to seeing in a new light the great value of the precious gifts of the holy church that the clergy take with them to homes and offer them to parishioners in need as they minister to God’s people. Besides losing Mike’s enthusiasm when seeing his priest, many other things have very quietly disappeared as well with his falling asleep. The icon of the Mother of God has not received lately any flowers at all. It was never without flowers not even for one single Sunday when Mike was around. His love and adoration toward the Mother of God was so vivid that he kept supplying her icon with fresh and beautiful flowers every Sunday for a long time. I cannot even imagine what reward the Mother of God would have prepared for Mike in return for his expressed love toward her, and for his thoughtfulness and continuous remembrance of our God’s Mother. All the silent charitable offerings that Mike used to provide have stopped. Many church projects that needed funds and enjoyed the quiet sponsorship of Mike now will no longer be the beneficiary of his quiet generosity. The kind and soft advices and indirect suggestions that used to be very helpful have not been heard since then. With Mike falling asleep the opportunity for my Presbytera Linda who would enjoy making for him, as other parishioners did, his favorite soup or one of his desired dishes to show goodness and thoughtfulness toward a fellow parishioner has stopped to exist. Mike was a living example that could have been referred to when talking about the pheromone of the allegiance and loyalty of the Orthodox people toward the holy Orthodox Church of God. Mike, from the years before the inception of Saint Demetrios parish until he opened his eyes in the eternity never ceased to be the child of this parish, not even for one single day. Mike, would always light up with enthusiasm upon hearing the stories of the holy saints of the Orthodox Church. He would never get bored hearing about stories of a priestly ministry. Mike had great reverence toward the clergy of the Orthodox Church of God. He was a very respectful person with a high degree of piety. Mike greatly appreciated the notion of praying for former parishioners that had fallen asleep, and found great comfort that these prayers one day were going to be said for him. He was inspired when reminded that the impact of our actions in the sup-port of God’s church while we are on the earth will continually intercede for us in front of God and shower us with mercy even long after we are absent from this life. Every time the food bank basket is blessed during the church service, Mike’s name comes to mind because he was the winds under the wings of this ministry. Without his persistence and sacrifices this ministry would not have been born or taken off. 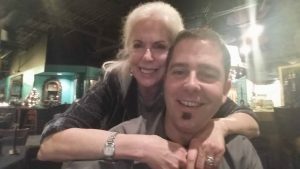 A few years ago when he fractured one of his ribs, his concern was directed less toward his healing and more toward who was going to carry it on. His happiness was tremendous when he was informed that this ministry has continued on and was flourishing through the support and the efforts of other parishioners. Mike in short was the invisible (SOMEONE ELSE WILL DO IT FIGURE) that every church community has that keeps church life going without interruption due to the selflessness and sacrifices of these God loving people; whose value and importance are not fully seen and understood until they are no longer among us. P.S. “BEAUTIFUL” was Mike’s favorite word as well as the LAST word he said as we spoke for the very last time. (Orthros, hierarchical Divine Liturgy. and Founders’ memorial/ Father Martin Ritsi and Deacon Athanasios Kartsonis will assist his Grace, Bishop Gregory of Nyssa). Hospitality hour will follow. The National Shrine Feast Day banquet will begin at 1:00 p.m., at Casa Monica Hotel (Tickets are $65.00) Key note address by His Grace, Bishop Gregory of Nyssa. The St. Photios Award will be bestowed upon AHEPA Speedway Chapter #410 and Consul General Adamantia Klotsa. Nicholas Aliferakis will be recognized for his volunteer service to the Shrine. Great Vespers and Artoklasia after the banquet presided by Rev. Dr. Nicholas Louh. Following the Vespers all are invited to welcome His Eminence, Archbishop Demetrios, Geron of America and Archdeacon Panteleimon at Jacksonville airport. The celebratory welcome will continue at the Casa Monica Hotel in St. Augustine. Monday, February 6, church services will begin at 8:00 a.m. St. Photios chapel. Rev. Dr. Nicholas Louh and Archdeacon Panteleimon Papadopoulos will assist His Eminence, Archbishop Demetrios, Geron of America. After His Eminence tour of the Shrine all will leave for the Orthodox Christian Mission Center. All the faithful are invited to attend a reception and program high-lighting the global work of this institution of the Assembly of Canonical Orthodox Bishops in America. His Eminence our Metropolitan Alexios of Atlanta is planning to travel throughout the Metropolis of Atlanta to meet with as many parishioners as possible from all of the parishes of our Metropolis. I believe you would agree that reaching out to parishioners in all the eight states of the holy Metropolis of Atlanta is a very ambitious plan, and a good goal to set. Please keep in mind that His Eminence is not in his thirties anymore, and he has tremendously loaded work schedule, yet he is going beyond his limits to reach out to YOU. His desire is to connect with parishioners directly to engage them in dialogue. Please let us do our part and respond with as many members from our Saint Demetrios parish to meet him at St. John church in Jacksonville on Tuesday, March 7 at 6:00 pm. We can carpool, and we can come up with some ideas to make this trip fun. I am open to your suggestions and ideas. Please communicate with me directly. RSVP is needed to communicate to the organizing committee. Please message me directly. I thank you for your attention and look forward to hearing back from you about your plan in regard to attending this meeting with His Eminence. Thank you for responding to the need of the priest’s discretionary fund. It had been depleted and it is in need of funds. This is a line item that is completely funded through donations from generous parishioners like yourself. The spending of these funds depends on the sole discretion of Father Joseph. Over the past years many generous donations have been graciously given to this fund, and last week donations started to be offered. This fund responds to various needs and necessities that come to Father Joseph’s attention. This current setting makes this process quick and private. There is no need or requirement to consult with many people or to reveal the es-sence of the needs before issuing a check. The process simply requires Father Joseph to ask the treasurer to issue a check. If you desire making a donation toward the discretionary fund, please send your check payable to Saint Demetrios church earmarked; “Discretionary Fund”. May God bless all the parish council members along with their families, and the entire parish family of Saint Demetrios. Please keep all the parish council and ministry leaders in your prayers to be guided and guarded by our God Jesus Christ. The Philoptochos of Saint Barbara through the dedication of many Philoptochos ladies and parishioners presented Saint Demetrios with a very successful and joyful cutting of the Vasilopita Sunday in support of Saint Basil Academy. Thanks are due to our great God that inspires hearts and minds to serve him by empowering his servants to serve others, and by pouring out his joyful and serene grace in the midst of his people. Please be assured that because of your positive attitude, persistence, and perseverance in the service of God, the entire parish family of Saint Demetrios is being rewarded with abundant divine grace in a matter suitable to every need of each person. It seemed that the weather and the rain were going to be challenging elements, but things took a turn for the better, and everything went very well and ended up to be a very happy occasion. The Divine Liturgy through the effort of a very dedicated team went very well; the diving for the cross was a blissful event; and the barbeque afterward turned out to be a nice celebration. Several parishioners that made the choice to stay home called me afterward and expressed their regrets for making that choice; however, they were happy to learn that this year’s celebration was another joyful and happy day. They hope to make up this loss by attending the event next year. Please take a moment after you have read the article if you will to send a short note of thank you to the writer of the article; Seth Robbins (seth.robbins@news-jrnl.com) and share with him your sentiments. We hope that you and your family had a Merry Christmas and pray that our Good Lord will continue to bless you and your family in 2017. As you lay out the plan for the New Year, please take the time to fill out the 2017 St Demetrios Greek Orthodox Church Stewardship Commitment Pledge Form located in the link below. This will secure your position as a committed member of your St Demetrios church community. This will acknowledge your conscious commitment and enable you to participate in all ministries and sacraments of our Greek Orthodox faith. This will confirm that you are a steward of our Lord’s property here on earth (in Daytona Beach). Please take a moment to review your current financial position and search in your heart to figure out the dollar amount that you feel comfortable giving to continue the Ministries of your church. This is not a binding pledge; treat it as a goal that you are going to attain in 2017. This commitment also helps our community budget properly in the upcoming year. The form must be filled out, according to our bylaws, in order to secure your position as a member in good standing. Your continued support of St Demetrios church is one way to show that you love and appreciate the gifts that our Lord has bestowed on you. May 2017 be a good, prosperous and blessed year for all of us. The gift from the Forest family had been sched-uled a while ago to take place on Wednesday Dec 21st, which later happened to coincide with the third day of Mike Forest passing away. 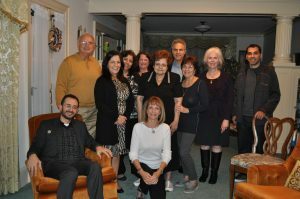 Gathered at the Forest’s house was a group of parishioners and PC members who witnessed this special moment in the life of the Saint Demetrios parish. The get together started with a prayer that was followed by the signing of the trust and the establishment of the St. Sophia Trust, and the deed for the transfer of the Forest gift to Saint Demetrios. After the end of the Paraklesis service at the church, a Trisagion was read for the rest of the soul of Mike Forest. Mike before his passing had been checking on the progress of the house transfer process quiet often with concern. He had wanted to make sure that it was going to get done as soon as possible. Christ is Born! Let us Glorify Him! It is with great joy that I share with you the deci-sion of the St. Photios Executive Committee and National Shrine Pilgrimage commit-tee to bestow the St. Photios Award to the AHEPA Daytona Speedway Chapter #410 in gratitude and recognition of the steadfast financial support and consistent witness of the immigration history of the first Greeks to America. The legacy you have built in the New Smyrna Memorial will be passed generation to generation. The support of the Essay Contest and Greek Landing Day are tantamount to the success of these programs. The sharing of the Shrine story with hundreds every year fulfills our goal to witness the Orthodox and Greek presence in America prior to 1776. Do you have a purse, backpack, or other bag you no longer want? Fill it with snacks, sanitary and hygeniene products and drop it off in the designated bin in the Narthex. Philoptochos volunteers will make sure the donated bags get to the homeless in our community.